Get ready, friends, it’s time for Summer Shape Up 2017! I’m so excited to be on this journey with you again, and ready to watch you crush those summer fitness goals! 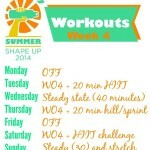 Summer Shape Up is 4 weeks of free workouts, meal ideas, giveaways and group support!! You’ll change up your routine, build lean muscle and hopefully have fun doing it! 🙂 Save This Post! This post will serve as “the hub” for EVERYTHING SSU 2017 related. Bookmark it, pin it, make it your homepage, do whatever you need to do to make all of the info easily accessible to you <3 For even more fun, spread the word with friends and make it a group challenge! Each week of SSU, I’ll update this page with weekly fitness plans and meal ideas. Please keep in mind that these are general recommendations, based on healthy (injury-free), gym-going girls, experienced with basic strength training form and a baseline cardio program. Nothing I post should substitute doctors’ recommendations, and always check with a doc before making any fitness or nutrition changes. If something doesn’t feel right, DON’T do it! You know your body best. 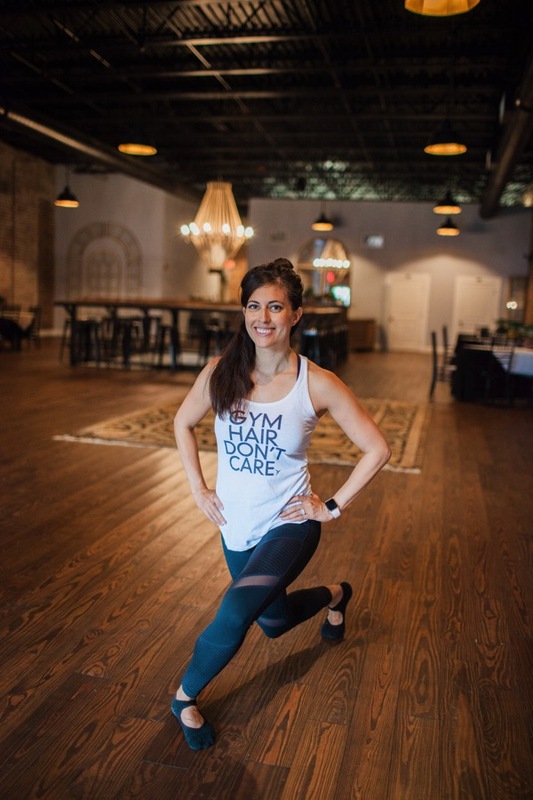 I do provide low-impact and pregnancy modifications, but it’s up to you to use your best judgement and doctor’s advice to complete a safe workout. Summer Shape Up is NOT about weight loss. It’s about decreasing body fat (adding lean muscle), feeling more energized and changing up your current routine. Even though the scale could go up during the next four weeks, you could technically “shrink” and weigh more. Muscle is more dense than fat. If anything, focus on how you FEEL! I hope that my ideas will help you find some new strength moves you love (or love to hate?) 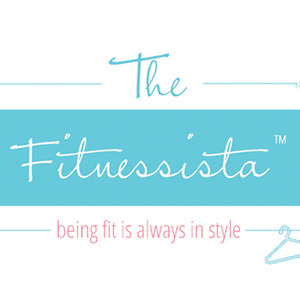 and develop the best fitness program for you. Bonus: workout buddies! Round up the troops. Before we get started, take some “before” pics wearing a swimsuit or sports bra and fitted shorts, so you can take some “after” shots at the end of four weeks. Bonus points for bad lighting, bad posture and a grouchy look on your face. How do I check in with the workouts? 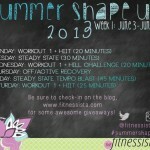 Leave a comment here on the blog, or tag me on Facebook/Twitter/Instagram (@fitnessista #summershapeup). You can also join in the fun in our interactive private Facebook group. It’s a great way to share support for other SSU members and ask questions. 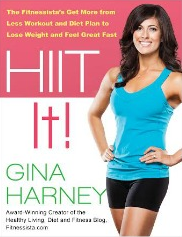 I am a planner and would like to get the meal ideas and workouts early! How do I do that? Before each week begins, take a second to jot down your goals for the week. 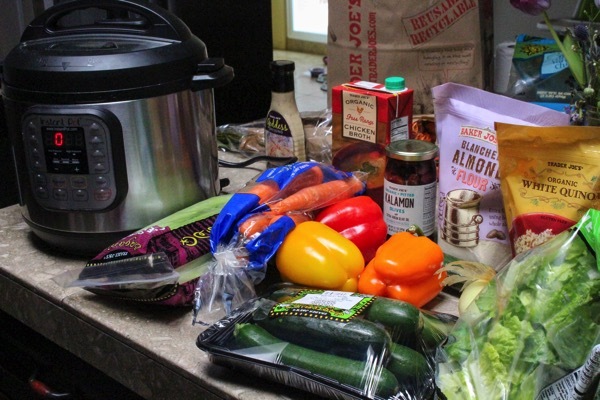 Grocery shop for staple foods, making sure to emphasize clean, whole choices. “EAT LIKE A PRO” throughout the challenge, making sure that each meal/snack has a PROtein and PROduce component. -Prep as many clean eats as you can in advance and put your workout calendar in an easily visible spot. This way you’ll be more likely to stick to your goals. -For your meals, mix and match according to your preferences and needs. Give yourself some room for repeats (for example, I have banana-oat pancakes at least twice a week), allow for one night of leftovers and one night out to enjoy dinner at a restaurant or out with friends. Before we head into Week 1 details, I want to thank our amazing sponsor, Naturally More! I LOVE Naturally More nut butters. They taste fantastic, and include probiotics and flax. They’ve been a favorite of ours for years, and I’m so excited to welcome them to the SSU party. Their nut butters are non-GMO, gluten-free, vegan, and have no trans fats. They have a variety of flavors (crunch and creamy peanut butters, natural almond butter with probiotics, chocolate hazelnut spread <— my personal fave, and organic Valencia peanut butter). They have a handy spout at the top so you can easily squeeze the nut butters onto fruits, oats, or into smoothies, and I joked with the Pilot that they were like baby food pouches. WAY easily than getting a spoon out of the fridge. I can squeeze it directly into my mouth hahah. 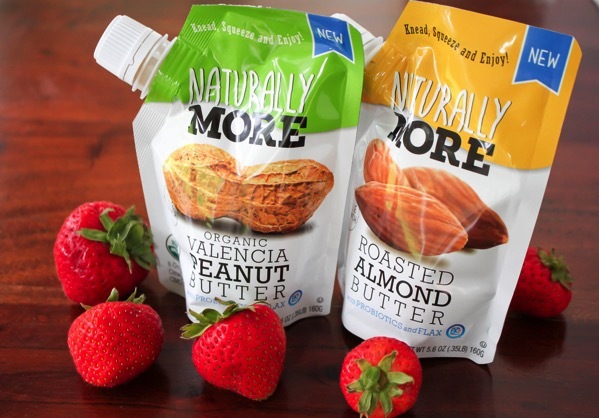 This means they’re perfect for stashing in your purse or gym bag for an on-the-go healthy snack. Stay tuned for some fun giveaways and Naturally More goodness throughout the challenge. and Lindsay Colson for all of the photography. Now, let’s get into Week 1! Are you ready for it?! Leave me a comment and let me know! 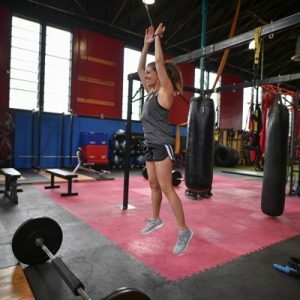 What’s a fitness goal you’re working towards? Just completed workout 1. Very sweaty! SO excited to begin! What would you do for sides for meals like the Garlic Lime Salmon and other main meals??? Yay! I was about to have a baby last summer and didn’t participate, so am extra excited this year 🙂 Also, I’ve had frozen acai in my freezer for like a month, unsure what to do with it, so am definitely going to try out your recipe this week. I tripped the other day and have to skip running for a while until it feels 100%. This couldn’t have come at a better time! Yay! I love this every year!! So many recipes to save!! Yay! I am so excited! Usually I start these and then don’t finish! This time I am ready! I created a folder for everything and measurements are taken. Let’s do this! Tried workout 1 last week and can’t wait to do it again today! I have two questions while perusing the calendar. Is steady state cardio just the elliptical/bike/treadmill? Are hills cardio with more of an incline? 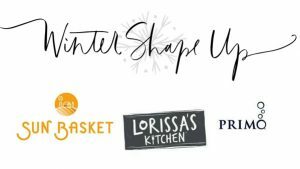 This sounds like a great program to keep accountable, especially when hitting the beach sounds better this time of year 🙂 I keep a lot of the same staples on hand and also love shopping at Trader Joe’s. 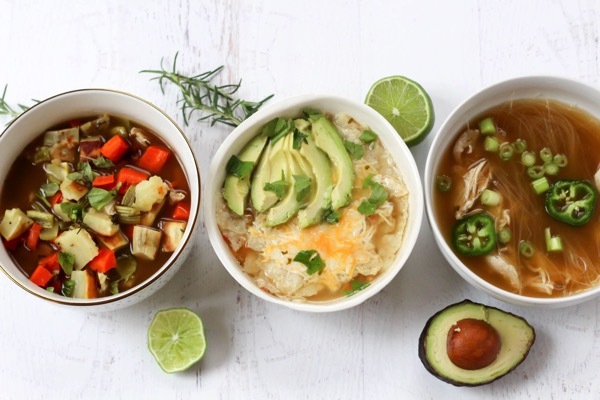 It’s my go-to for healthy grocery stock-ups every single week. PS. Your new logo for the program came out great! Love it. Did workout 1 this morning – loved it! i love naturally more! excited to do WO1! Did two rounds of workout 1 this morning. I am almost 5 months postpartum and am modifying where needed (hello plank and punch! That one was not happening on my toes) Looking forward to showing my body some love and grace over the next 4 weeks! I’m in! Love the chance to change my routine. Loved WO#2 so far! YUM! 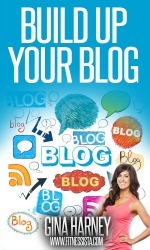 So many great ideas, love this! My Monday workout was a lunchtime walk (with an iguana sighting!) and then xtend barre class after work. Workout #1 kicked my booty last night. Thanks for putting this on. Workout #1yesterday and spinning today! Thanks!!! Workout #1 was a great sweaty mess! I also knocked out 4 miles this morning for my steady state and now looking forward to the rest of the weeks! Where did you get that tank top from? I need that! 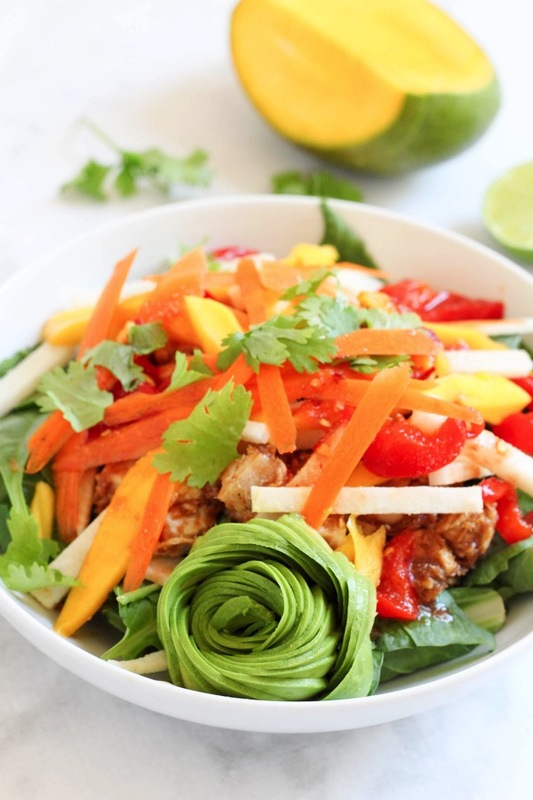 Currently enjoying a Spring Roll Salad and omg it’s my new favorite! I’m honestly really bad at doing a yoga workout without a video to follow along with, so I did a Yoga With Adriene video yesterday, and I plan on doing Workout #1 today when I get home! Yay! So glad it’s back! only had time for two rounds of workout 1 (i’m a day behind), but I’m super schweaty now! I’m hoping to build some functional strength and build up some vanity muscle! Thanks for the awesome workout! this was a fun one! Did workout 1 today. Used 10# weights for the lunges. I think that was a mistake! I’m already sore! I totally needed workout #2 today, thanks! Check in for last night’s Xtend Ball (aka barre with a fit ball) class. It was tough! The cues can border on obscene when you’re doing abwork and putting the ball between your legs. Yea!! Thank you. Can’t wait to wake up and bust it out! I’m a little late to the game, but I’m excited to start this tomorrow! 🙂 I love that you don’t focus on weight loss or what you look like (and instead on feeling better). As someone who used to be addicted to exercise and disordered eating, but who needs exercise to feel strong and happy, your approach is very much appreciated!